Social media outlets exploded with both condolences and hateful comments following the death of 81-year-old Arizona Sen. John McCain on Aug. 25 due to brain cancer. Celebrities and politicians on both sides of the aisle tweeted sympathy to his family alongside testimonials of his courage and integrity. Social media also erupted with posts that disrespected McCain’s legacy and in many cases expressed glee at his passing, criticizing him for his consistently hawkish pro-war stance and alleged past racist remarks. Some of these commenters posted false accusations, such as one tweet that claimed he gave information “that led to the downing of 60 aircraft” and that he “trained North Vietnamese air defense personnel.” Others posted facts about his questionable — and sometimes wrong — decisions as a public servant. After Sept. 11, 2001, he supported military interventions in Afghanistan and Iraq, even after public opinion turned against involvement, and he supported the bombing of Libya. There are accounts of insensitive and racist remarks McCain made over the course of his career, including a racial slur against his Vietnamese captors during his time as a prisoner of war, for which he refused to apologize. But the outburst of crude and false accusations goes against the way he persistently held himself. His willingness to compromise and the way he handled many political disputes should be respected regardless of political affiliation, and we would do well to further emulate him in politics today. The senator’s decades of service to his country include his time as a Navy fighter pilot during the Vietnam War, during which he was taken as a prisoner of war for five years and endured torture and confinement by his captors. He was elected to the U.S. House of Representatives in 1982 and four years later won a seat in the U.S. Senate that he would hold for the next 30 years. In his time as a senator, he often voted against his party or teamed up with Democrats. During the 2000 presidential campaign, he called for campaign finance reform and was against tax cuts for the rich. He worked with former Democratic Sen. Joe Lieberman on a bill to direct the United States away from fossil fuels and toward renewable energy. He also pushed for a path to citizenship for undocumented immigrants in a bipartisan effort. McCain’s long record of service and devotion to what he thought was right in spite of party lines demonstrates what many politicians and celebrities have tweeted about — his undeniable commitment to the United States, willingness to work with all sides and a strong belief in fighting for one’s country. Rather than playing into a supporter’s ignorance and fear, he stood up for his opponent because it was the decent thing to do. A difference in opinions on fundamental issues was no reason for any sort of disrespect from McCain to his opposition. 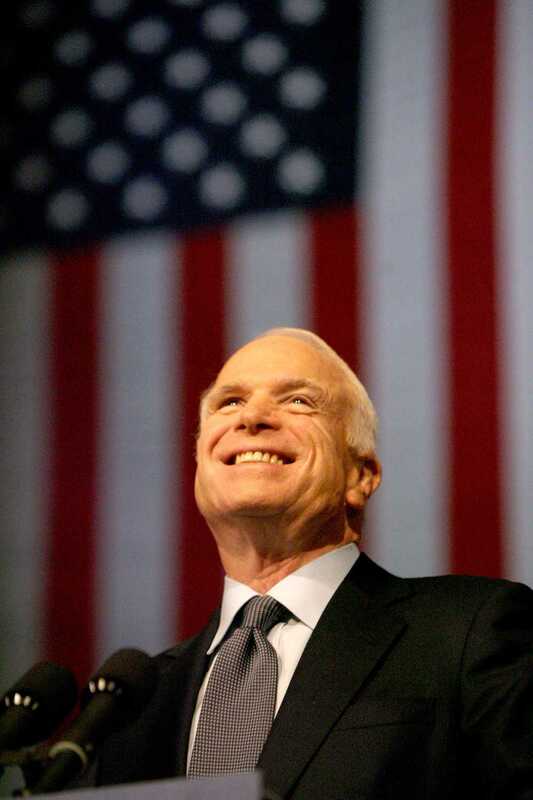 Democrats seem to have just as much praise for McCain as Republicans. Former presidents Obama and Bill Clinton, Sens. Elizabeth Warren, Bernie Sanders and Chuck Schumer, as well as many others have voiced their positive opinions of McCain’s service to the United States. Warren even remembers “forceful” disagreements on policy, but notes her respect for the fact that McCain always truly believed what he was doing was best for Americans. Even when he was wrong, McCain held himself to a high standard in the way he treated and worked with others. He often took ownership of his mistakes and apologized for them, like when he didn’t ask for Confederate flags to be taken down at a 2000 South Carolina campaign stop. He later apologized and admitted he “chose to compromise [his] principles” out of political self-interest. McCain’s grace in owning his mistakes — whether or not he took responsibility for each of them — is a dying trend in politics. Negative commenters should take a lesson from McCain about how to respectfully disagree with someone’s politics, rather than spewing more hatred.